President Moon Jae-in on Tuesday once again stressed the need to boost ties with Southeast Asian nations, and urged concerned government bodies to develop related projects. Speaking at Tuesday’s Cabinet meeting, Moon also said that the leaders of ASEAN and Asia Pacific Economic Cooperation member nations gave positive assessments of developments on the Korean Peninsula, and expressed support. Moon was in Singapore and Papua New Guinea last week to attend ASEAN and APEC summits, and a series of bilateral meetings with world leaders, including US Vice President Mike Pence and Russian President Vladimir Putin. “ASEAN, India and Australia welcomed and expressed firm resolve to cooperate with the New Southern Policy,” Moon said, going on to say that the importance of ASEAN and India has grown to the point that Korea’s future could be said to depend on relations with the countries. Moon’s New Southern Policy aims to boost economic and political ties with nations to the south and southwest of the country. Moon said that ASEAN nations make up Korea’s second-largest trading partner after China, and that trade volume with the region showed 25 percent year-on-year growth last year. 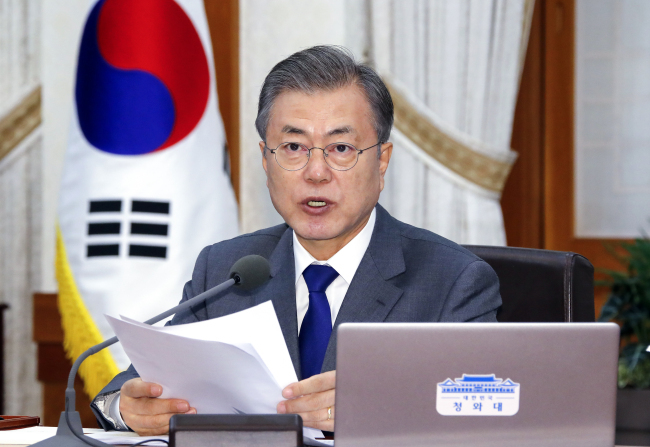 Citing trade and population figures of major markets in the region including India and Vietnam, Moon went on to stress their importance for Korea. “The New Southern Policy committee and concerned ministries should develop cooperative projects, and concentrate on achieving results,” Moon said, adding that cultural and human exchange projects should be developed as well as those concerning diplomacy and economy. Moon also urged officials who attended the meeting to make preparations for the Korea-ASEAN and Korea-Mekong summits scheduled for next year, asking them to launch a pan-government preparation committee. At Tuesday’s Cabinet meeting, Moon also called for more measures to support the country’s manufacturing sector, singling out the automotive and shipbuilding industries. Citing recent developments in the industries -- the increase in automakers’ output and the Korean shipbuilding industry retaking the top spot in terms of global market share -- Moon stressed the importance of manufacturing for the country’s economy. Saying that it is the government’s duty to support industries that are experiencing difficulties, Moon called for short-and long-term support plans, including aid in R&D.